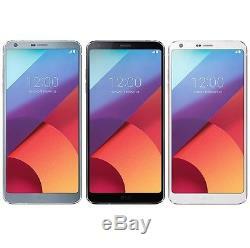 LG G6 H870DS 64GB (FACTORY UNLOCKED) 5.7 QHD. Mystic white, Astro black, ice platinum, Gold, Blue, Raspberry. Brand New in Sealed Box. 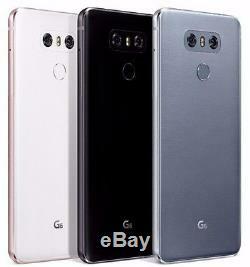 GSM 850 / 900 / 1800 / 1900 - SIM 1 & SIM 2 (dual-SIM model only). HSDPA 850 / 900 / 1700(AWS) / 1900 / 2100. LTE 2100(B1) /1800(B3) / 1700(B4) / 850(B5) / 2600(B7) / 900(B8) /700(B12)/ 800(B20) / 800(B26) / 700(B28) TD 2600(B38) / 1900(B39) / 2300(B40) / 2600(B41). 148.9 x 71.9 x 7.9 mm (5.86 x 2.83 x 0.31 in). 163 g (5.75 oz). Corning Gorilla Glass 5 back panel. Dual SIM (Nano-SIM, dual stand-by). IP68 certified - dust/water proof over 1.5 meter and 30 minutes - Water resistant up to 1 meter and 30 minutes. IPS LCD capacitive touchscreen, 16M colors. 5.7 inches (78.6% screen-to-body ratio). 1440 x 2880 pixels (564 ppi pixel density). Dolby Vision/HDR10 compliant - Always-on display - LG UX 6.0 UI. Android OS, v7.0 (Nougat). Quad-core (2x2.35 GHz Kryo & 2x1.6 GHz Kryo). MicroSD, up to 256 GB (uses SIM 2 slot). 64 GB, 4 GB RAM. Dual 13 MP (f/1.8, OIS, 3-axis, phase detection AF) + 13 MP (f/2.4, no AF), dual-LED flash. 1/3 sensor size, 1.12 µm pixel size, geo-tagging, touch focus, face detection, HDR. 5 MP, f/2.2, 1080p. 32-bit/192kHz audio - Active noise cancellation with dedicated mic. Wi-Fi 802.11 a/b/g/n/ac, dual-band, Wi-Fi Direct, DLNA, hotspot. 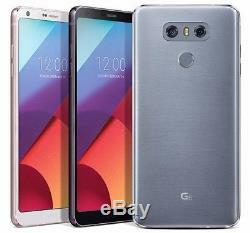 V4.2, A2DP, LE, aptX HD. Yes, with A-GPS, GLONASS, BDS. V3.1, Type-C 1.0 reversible connector, USB On-The-Go. Fingerprint (rear-mounted), accelerometer, gyro, proximity, compass, barometer. Fast battery charging: 50% in 30 min (Quick Charge 3.0) - MP4/DviX/XviD/H. 265 player - MP3/WAV/FLAC/eAAC+ player - Photo/video editor - Document editor. Non-removable Li-Po 3300 mAh battery. Our items are International and work with GSM networks only. Do not work with CDMA carriers like Verizon, Sprint, Boost... It helps our business greatly. If you feel that you can't give it to us- Please let us know what we can do to be better. This way we will know how to improve our customer service. And Overseas as Zambia, Kazakhstan... If so, we may ask you to pay the difference. Any other country in the world. Address cannot be changed at any time. Misused or abused merchandise will not be accounted as defective. This policy may be modified or changed without any further notice. Only International items are Factory Unlocked without carrier logo and/or region lock. 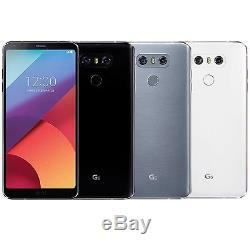 The item "LG G6 H870DS 64GB (FACTORY UNLOCKED) 5.7 Dual Sim Black White Platinum Gold" is in sale since Thursday, March 16, 2017. This item is in the category "Cell Phones & Accessories\Cell Phones & Smartphones". NOT Compatible With: CDMA Networks (Verizon, Sprint, etc.